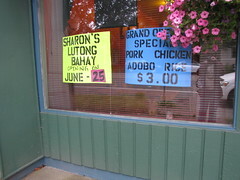 Signs in the window of Sharon's Lutong Bahay, a Filipino restaurant just south of Beacon and Stevens, say that the restaurant's Grand Opening is this Friday, June 25. Photo by Wendi. Jerry Large of the Seattle Times (BHB news partners) featured Jeane Cook and Kim Nakamura in his column yesterday. Cook and Nakamura, who are both in their 90s, were honored by Beacon Hill International School (formerly Beacon Hill Elementary) for nearly 30 years of volunteer work at the school. Large also mentions that the BHIS Golden Acorn award for volunteers this year went to Pat Dederer, who has been helping at BHIS for 20 years. We here at the BHB would also like to express our gratitude to Cook, Nakamura, and Dederer for their service and contributions to the lives of Beacon Hill kids over the decades. You may have noticed some work near Jose Rizal Bridge this week. The Seattle Department of Transportation (SDOT) is installing curb ramps in the intersection of 12th Avenue South and South Charles Street at the north end of the bridge. Crews plan to work until Thursday, from 7 am to 2:30 pm each day. They will close the western and then the eastern sidewalk and parking strip, one at a time, to complete the work. Speaking of construction work, work on the Chief Sealth Trail Extension project will probably start in late August. The project will take about three months. Afterward, the trail will extend northwestward from Beacon Avenue South northwest to South Angeline/15th Avenue South. SDOT has completed its environmental review of the project per the State Environmental Policy Act (SEPA) and determined that there will be no significant adverse environmental impacts as a result of the project. To see the DNS and other environmental documents as well as a map of the project, see the project web site. Verity Credit Union is hosting a community shred-a-thon on Saturday from 10:00 am – 2:00 pm. At this event, community members who don’t have their own shredders can have the security of shredding their sensitive documents. There is a suggested minimum donation of $10 which will be donated directly to the Beacon Hill Food Bank. Verity is located at 1660 South Columbian Way, Building 35. Helping Link, or Một Dấu Nối, is a non-profit group that provides tutoring, citizenship and English classes, and social services to the local Vietnamese community. They are having their annual fundraiser, the Seattle International Fashion Gala, this Saturday, June 26, at O’Asian Kitchen Restaurant. There will be an array of modern and traditional gowns premiered by fashion designers, Oscar Milano Mai and Chi Duyen, along with Asian cuisine. Proceeds of ticket purchases will go towards the support of Helping Link’s community strengthening programs for Vietnamese refugees and immigrants. More information can be found on the website. The Bar del Corso pizzeria folks are holding a fundraiser on Sunday from 3:00 to 6:00 pm to help raise funds for the restaurant they plan to open on North Beacon Hill early next year. They say, “Jerry will be firing up the brick oven in our backyard garden, and making pizzas. With fava beans and garlic in season, we will be making some special pizzas with these ingredients, along with other classics.” The suggested donation is $100, but “the donation amount is suggested—pay what you can.” RSVP is required to info@bardelcorso.com (with RSVP in the subject line). They will send you a confirmation email with the details and the address of the party. Beacon Lutheran Church will be holding a Bible and Chinese Camp for children from ages 4 through 12 this summer, August 16-20. The program will run from 9:00 am to 3:00 pm and will provide Bible lessons, singing, crafts, and games, as well as Chinese language and culture lessons. Snacks will be provided morning and afternoon, but each child should bring a sack lunch. For more information or to register, call Father Philip Wong, 253-277-1831 (in Chinese or English), or Eunice Graham, 206-323-0226 (English only). …well, provided we get sun at some point. Any info or schedule on the Moutains to Sound trail extension? but I don’t see any references on the M2S website.